Breaking Up Is Hard to Do: Should You Quit the Band? Should I Quit the Band? Band relationships are some of the most intense relationships you can have. All of your hard work, hopes, and dreams are wrapped up in each other, and with all of that pressure, there are bound to be some pretty heated moments. And just like any other relationship, having a fight doesn't mean you should jump ship. It sounds pretty obvious, but many people join bands because they think they just want to play, only to find out they don't want to play just any old thing. There is a band out there making music you love. Find them. Are you contributing to songs but not getting credit for your contributions? Or do your bandmates never want to discuss who wrote what? You may not think this is a big deal now, but if one of your songs is a hit, this will become an important issue. Whether this stems from a bandmate being shady or just careless, it still needs to be handled. 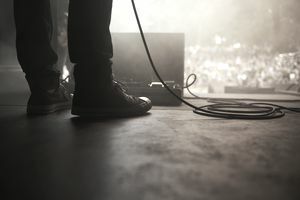 Okay, this is music, not some 9 to 5, suit-and-tie kind of gig, but if your bandmates can't show up on time (or at all) to practices, soundchecks, and shows, then they don't love being in a band, rather they love telling people that they are in a band. No one is too rock 'n' roll to practice. Does your band have opportunities, like tours and recording sessions, that you can't commit to, for whatever reason? Do the decent thing and bow out. Bands cost money, and everyone in the band should contribute equally as much as possible. Things come up, and sometimes one band member has a pocket full of cash when another is flat broke, and that's fine now and then. But if one person is making all of the sacrifices, all of the time, there is a problem. Partying like rock stars before you become rock stars is counterproductive. This is music, and everyone likes to have a good time, but when the good times start to take a toll on your performances or distract you from the business of the band, that's a problem. You'll make a bad impression on the people you need to impress when you treat your shows like your personal booze-fest. If the people in your band can't grasp the distinction between the partying and the playing, you are most likely on a sinking ship. Of course, none of these red flags have to mean you should leave the band. Maybe you can address these issues, fix the problem, and get back to the music. But if these problems just won't quit, it may be time to pack up the gear and head for the door.